8 am in November, on a sometimes-winding road flanked on either side by acre after acre of sunflowers smiling at the sun is certainly a good morning. North Karnataka has a rather sunny disposition with this flower being a cultivated crop in these parts. If there aren’t sunflowers, there are exuberant yellow and orange marigolds, eager to take over the task of brightening up the landscape. After Hampi, we were headed for older periods - Aihole, known as one of the cradles of temple architecture, Badami with its surreal cave temples and Pattadakal where kings came from everywhere to be crowned and bestowed with a kingdom - were on today’s itinerary. If you plan on visiting Hampi, I’d suggest you extend your trip by a day and explore this belt as well. The temples are older and some, are even in better condition. Aihole gets it name from an exclamation and is an exclamation of sorts in itself. Legend has it that, Lord Parusurama after avenging his father’s death washed himself in the river Malaprabha, turning it red, which made him cry ‘Ai, ai! Holi!’ (Ah! The river). The ancient temple town has some extraordinary specimens of temple architecture, some as old as the 7th century and even has stone tombs that date back to the prehistoric era. Aihole was the first Chalukyan capital and it’s evident that here’s where they tried out new styles of temple architecture. Our first impression of Aihole was the unusually shaped Durga Temple. The only one of its kind in all of India, the temple apparently is dedicated to the sun god and gets its Durga reference from Durgagudi which means ‘temple within the fort’. Within the same walled area is a cluster of temples that varied as much as they were beautiful. 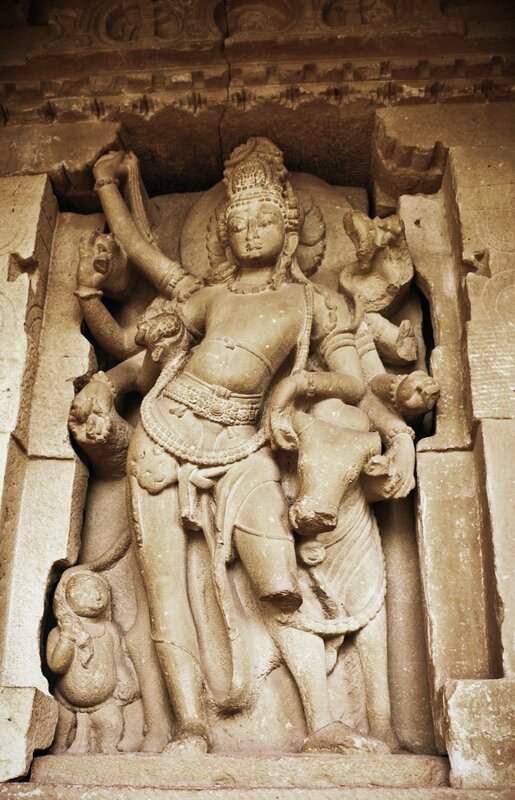 If the Durga Temple was resplendent with elaborate carvings, the Ladh Khan Temple - the oldest temple in the complex that dates back to the fifth century, is relatively austere with its Shivalinga and Nandi bull sitting in a companionable silence as they have for centuries. They lost interest in me the minute they heard my fractured Kannada. ‘Guide, madam?’ ‘Beda’(No thanks!). I’d have employed their services if I had the time, just to see what tall-tales these street-savvy, pint-sized rather charming frauds would try to pass off as historical facts. Without a doubt, their version would be miles and miles away from what the guide books and wikipedia had to say on the subject. Again, get a licensed guide. There’s even a grievance facility, where you can lodge a complaint if you find a licensed guide unhelpful. Most of them take a lot of pride in their work, so it’s highly improbable that you’d be displeased with their services. Right inside the complex, the evolution of temple architecture is evident and measurable. Even styles have been experimented with, some temple are not built on Dravidan tenets. The 7th century Huchimalli Temple has a very discernible North Indian tang to it and is one of the first examples of having an ardhamantapa or an ante-chamber annexure to the main shrine. The stretch between Aihole and Pattadakal is again peppered with ancient temples - so commonplace, that the locals hang around them like we’d do at a Coffee Day - without giving it too much thought. 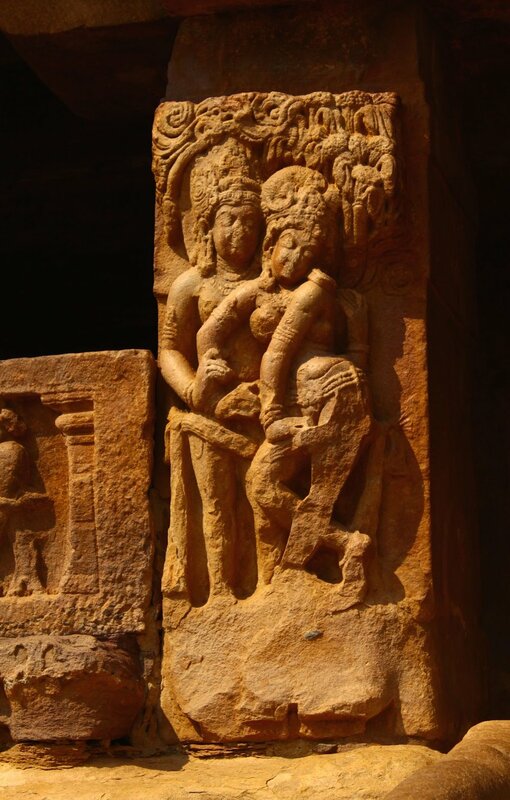 Along with Vedic influences, Aihole’s architecture has strong Jain and Buddhist influences. Just a little away from the complex are 5th century cave temples hewn into a rocky hill. These ubiquitous but no less awesome, steep, gigantinormous anthill-like sandstone superstructures run all along the landscape of the belt. I always find myself wondering if God created Karnataka on a particularly creative day. The geography changes without warning, colours pouncing at you from behind every bend in the road, trees have a prehistoric gait, the rivers are shrewd and the very air is virile - the earth has grown into a pan-chewing feisty old woman who has no qualms showing off her wrinkles and her giddy, if sometimes improper, escapades. Even if you weren’t a temple or architecture or history buff, this stretch has all the trappings of an unforgettable biking trip. Great photos, great pitstops, great scenery and great destinations within a 100 km radius. Except that there’s no food. All your eating should be done at Badami. 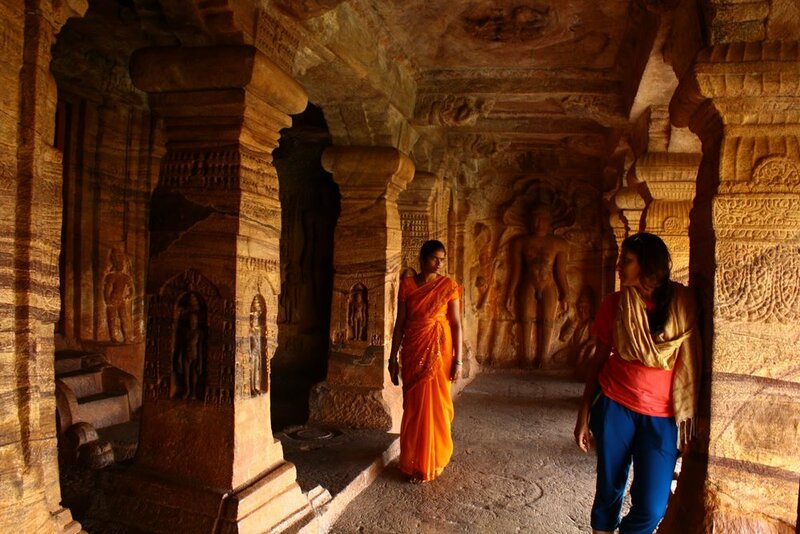 Aihole and Pattadakal only offer facts and killer scenery to chew on and little else. If the earth here is a carefree old woman, the civilisations that were born of her womb have been, as the case always is, rather diligent and dutiful children. They’ve gone on to achieve greatness as if to make up for their motherland’s whimsical ways. Pattadakal was the destination of kings, quite literally. Many a king made the journey from the furthest outreaches of the Deccan to be crowned at the Sangameshwara Temple, a Shiva temple that dates back to the 7th century. 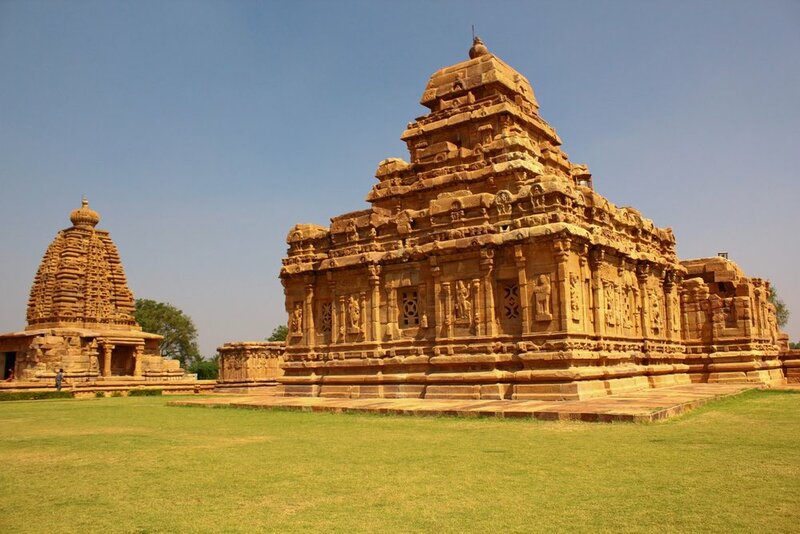 The name Pattadakal comes from ‘pattada kallu’ that literally translates into coronation stone. Over 90 kings are believed to have been crowned at the Sangameshwara Temple, which bear the signs of being incomplete - leading to many a speculative hypothesis on why it might be so. It’s a tad surreal to see so many styles of temple architecture just about yards away from each other. There are both Dravidian (South Indian) and nagara (North Indian) styles of architecture - not a common sight. 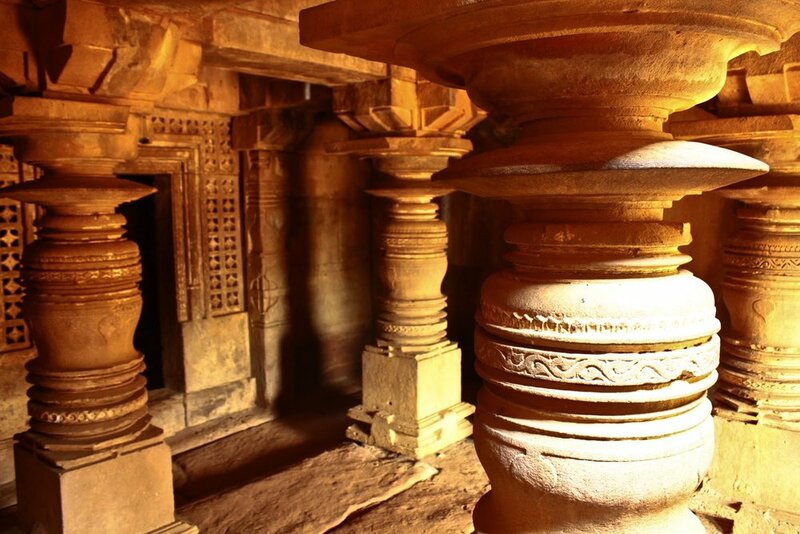 Time has preserved the details on these temples rather well and the temple complex enjoys UNESCO World Heritage status. The scenes from the myths chiselled on walls, roofs and what not, are still sharp and breathtakingly elaborate. The Virupaksha Temple which stands whole and complete at the end of the complex is the only 8th century temple that isn’t in a state of disrepair. It was commissioned by Lokamahadevi, the wife of Vikramaditya to commemorate his three victories over the Pallavas and occupation of Kanchi. The only temple in the entire complex which had worship in progress, we were a little wary about photography inside the temple. But as long as you are discreet and respectful, the priest lets you be. The interiors of the temples are generally dark and this one was no different. Lit only by means of a skylight, sudden bursts of flash photography momentarily startles everyone inside the temple. But a rally of school noisy school children, obviously on a school excursion diverted everyone’s attention. Quietly, leaning against a pillar sat an artist sketching away. The size of his portfolio, with reproductions of the carvings on paper indicated that he was a regular. Our guide was again, rather enthusiastic, and clambered up pillars to point vital parts of the stories etched on those walls, lit up alcoves where sculptured treasures stood almost forgotten. At Pattadakal, a guide could cost you about Rs. 250 during the off-season and Rs. 350 during the peak season. But again, worth it. Just outside the Shiva Temple is the mandap with the Nandi Bull, which looks freshly hewn belying its true age. This temple is believed to have been the inspiration for the famous Kailasa temple at Ellora and has many fascinating depictions on its walls. Shiva emerging from a shivalinga (with its undeniable Romanesque influences), Gandaberunda, Vishnu’s two-headed eagle avatar that has found its way onto the official seals of many a dynasty - the present Karnataka government included - were some of the unusual carvings on the Virupaksha Temple. Over 32 small shrines dedicated to various goddesses surround the complex. The monkey and the crocodile, and other characters from the Panchatantra were as much a part of my growing years as Cinderella, Snow White and the Sleeping Beauty were. So seeing the stories depicted on the interior walls of the Mallikarjuna Temple was sort of like meeting a long lost friend. The monkey who fooled the crocodile into believing that he left his heart on the highest branch of his tree for safekeeping and the woman who hastily killed the mongoose that protected her baby from a snake, mistaking the snake’s blood to be that of her baby’s and many such stories are part of the wall carvings. Pattadakal wasn’t the Chalukyan capital for nothing. The temples are proof of an era that was well ahead of its time - where art, literature and other scholarly pursuits flourished. There’s unmistakable pride in the guide’s voice when he informs us that the world-famous sun temple at Kornark, Orrisa is said to have been inspired by the majestic Kashi Vishveshwara Temple with its sandstone, elaborately-carved spire-like structure or the rekhanagara. Post-lunch at Badami we had the rock temples of Badami on the itinerary. There are times, when a place doesn’t quite match the expectation the brochures and the leaflets and the photographs build up. But till date, that’s never been the case with anything or anywhere I’ve seen in Karnataka. If anything, they’re underplayed - for no photograph or the most eloquent adjective, metaphor or simile match the sheer high of the experience. Tourism here has somehow eluded that ugly space where it’s just about elevator music, fridge magnets and souvenirs, and instead has served its true purpose of taking road and facility to these otherwise inaccessible places. The more you invest yourself as a traveller, the richer and more vibrant your experience proves to be. Creature comforts might not be on the top of the list of these slightly-out-of-the-way circuits, but as experiences they’re one-of-a-kind and sort of make you evolve as a person. Badami is a town that is in love with colours. A predominantly farmer community, there are more tractors than you can shake a stick at. But of course, you’d not want to shake a stick at a tractor - what you might need to shake a stick at are the brazen monkeys that are EVERYWHERE! Badami is teeming with sights, sights and more sights. If there isn’t a carnival float of a tractor either trying to blind you or coming right at you, there’s a brigand monkey ready to hold you at snarl-point for your food. The teeming marketplace is a far, far cry from our sterile supermarkets and is such a nail biting experience. Your head wants to turn in ten different directions at the same time, for there are ten different things happening in the aforementioned directions and you don’t want to miss a thing. The tractors are decked to their very gills. Tractor-art take Indian kitsch to an entirely different level - from Christmas shiny paper festoons in gold, silver, blue, yellow, orange, red, pink to bunches of plastic flowers, it goes where lorry-art fears to tread. The people here definitely like their colours bright and over-the-top. We were advised to not carry our rather big, brightly coloured handbags at the site. The monkeys are a curious lot and will think nothing of attacking you if they have reason to believe that you are in possession of food. And these monkeys, ironically have no time for monkey business. They are more mafia-like in operation. If they don’t like you, they bump you off. So making eye contact is a terrible idea. Just have your hands up in the air and you’re okay. Badami is located in a ravine at the foot of a rugged, red sandstone outcrop that surrounds Agastya lake to quote Wikipedia. 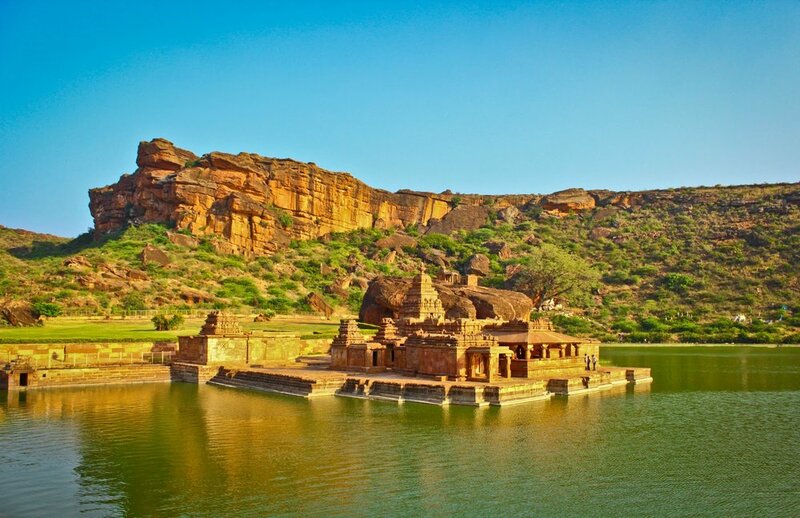 But I would say, Badami is located in a sepia hued hollow of timelessness, where a lake flanked by two tall sandstone hills and all their denizens conspire against and resist the banalities of mortality. We wheezed up the steep climb to the four rock-cut temples which lie one level above the other. And yes, when the sun was preparing to leave its workdesk in the sky. The climb would be much too exhausting during noon or late mornings. 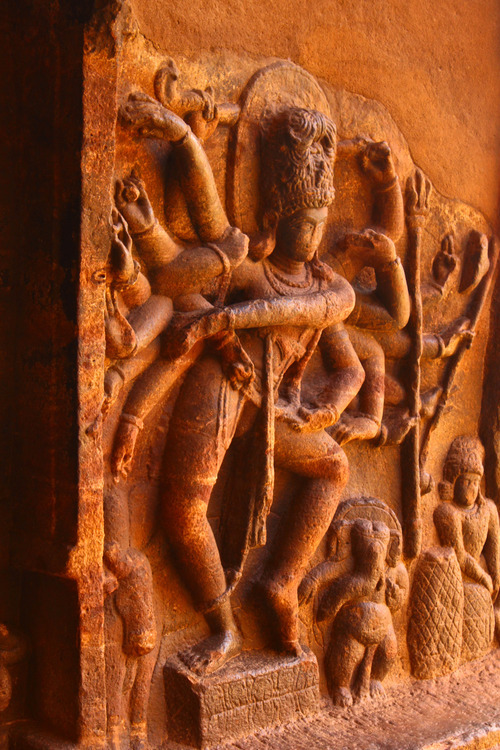 Badami believes in first impressions for the very first thing you see of the famous cave temples is a life-size image of the 18-armed Nataraja in the midst of his celestial dance hewn into the rock. The contours which haven’t blurred with time on these 6th century sculptures speak volumes on the mastery of Chalukyan sculptors and the pride they took in their work. Well, it wouldn’t be fair to attribute all that we’ve seen today to timelessness and resilience. The Archaeological Society of India has done its share to ensure that these treasures don’t succumb to negligence or wear. The second cave is dedicated to the avatars of Vishnu. With every level the monkeys get gutsier and the scenery more breathtaking. A woman being momentarily accosted by a monkey for her water bottle, which she surrendered immediately leave us with a case of jumpy nerves. But the view - the emerald of the Agastya Lake in stillness so perfect, that it couldn’t be anything else but love, with the indescribably tranquil Bhuthnatha Temple made us forget these little bullies. That unshatterable quiet of having grown old together, of having spent decades as one - quite the hopeless romantic, the sonnet of love that lay before me made me sigh. But as heart-stoppingly beautiful it was, there was more climbing to do, and I could not afford to squander precious energy getting misty eyed or being knocked breathless. The third level is the largest and the most extravagant among the four temples - the carvings are huge and really impressive. Lord Vishnu in his most awe-inspiring avatars takes on larger than life persona, quite literally. And the fourth level is starkly different. Dedicated to the Jain faith, the carvings are of Bahubali, Parshwantha and Lord Mahavira, the sudden shift in faiths momentarily made me wonder if the climb had made me dizzy and hence, I was seeing things. But no, it was indeed a Jain temple - more proof that our forefathers were so caught up with the business of being awesome that they couldn't be quite bothered with trifles like differences as we are today. Further up, we sighted a perch that looked like a watchtower, but as much as we wanted to explore it, it was already past sundown and the Bahunatha Temples were beckoning from across the lake. Across the Agastya Lake, is the steep climb to the North Fort, which is a place I’m convinced serves as God’s perch. The view is outstanding and you can see for miles around. Despite the monkeys, despite the tourists around you and despite the odd plastic bottle callously discarded, there is a certain zen to the place. Of being unaffected, of keeping what’s outside, outside; of a self-assured aloofness. Perhaps, the secret behind its agelessness. In the hour of the afterglow, Badami basks mellow and self composed. Legend has it that, two miscreant demons Vatapi and Ilvala had gained notoriety for killing passers-by with a particularly dirty trick. Ilvala would turn Vatapi into a ram and offer its meat to an unsuspecting guest. Once he’d eaten the meat, Ilvala, confident of his boon that would summon anyone whose name he called, even from the netherworld would call out Vatapi’s name - making him appear, ripping the person from inside out. The Sage Agastya called a timeout on their fun and games by digesting Vatapi before Ilvala could call him. The two hills apparently represent the two demons, with the manmade Agastya Lake between them. Incidentally, Badami formerly used to be known as Vatapi. 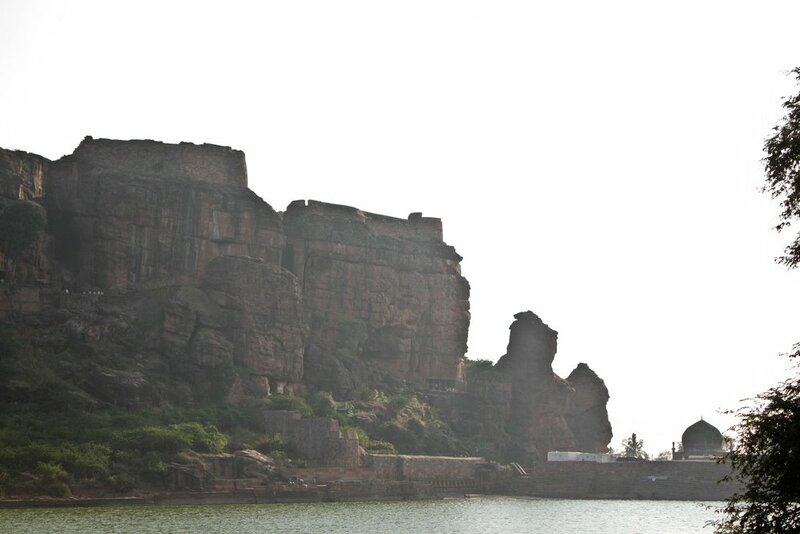 It’s also believed that Badami gets its name from the almond (badam) coloured hills. The soft browns of the Bhuthnatha Temple dedicated to the god of spirits and the dead gave me the impression that all must be well in the netherworld. Ironically, it also emanates, as it has since the 11th century, certain energies that made me feel like it was a mighty brilliant thing to be alive and in the presence of such incredible beauty. Nov 11 Hampi. A very photogenic lesson in history.